For millions of people around the world, Christmas is closely tied to Christian beliefs, after all, it is a celebration commemorating the birth of Jesus Christ. In fact, in many languages, the word for the celebration itself has to do with Christ or birth. Not so in Latvian where we celebrate “Ziemassvētki”, literally the “winter festival”. You see, until the German crusaders arrived in the 13th century, the people of the Baltics were the last pagans of Europe. To this day many traditions survive from the ancient pagan celebrations of the winter solstice – the longest night of the year. Over the centuries these old pagan traditions, characteristic to many Northern European countries, have blended and mixed with the Christian ones. Let me tell you a little about a few of the most interesting winter solstice traditions, several of which are still alive today. For the winter solstice homes are decorated with evergreens, most commonly fir branches and fir trees. Did you know that the tradition of decorating the Christmas tree most likely originated in the Baltics? Traditional decorations are made from straw, colored yarn, bird feathers, as well as dried flowers or dried fruit. These look nothing like the modern-day brightly colored and sparkly decorations, it is a more natural and subtle beauty. Another tradition that is supposed to scare away evil spirits, as well as to bring fertility and good luck, is rolling the yule log. The log, usually a sturdy oak with attached ropes, is rolled through the whole village or town to gather all the failures, the bad thoughts, and deeds of the passing year. At the end of the procession, the log is burned in a bonfire thus symbolically burning all the misfortune and sorrow to make a fresh start into the new year. Rolling of the log is a joyous event attended by many villagers or townspeople and often includes some singing and dancing as well. If you happen to be in Riga around Christmas time you should participate in the festivities! 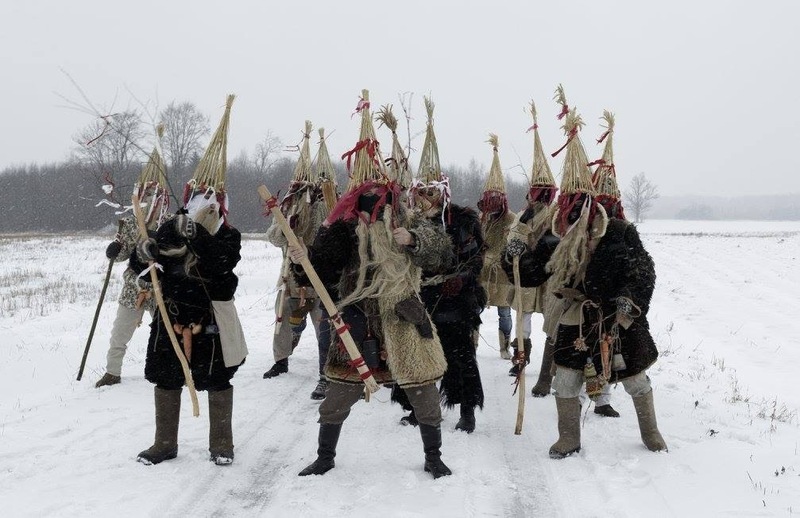 This particular tradition is known by different names in different parts of Latvia – budēļi, ķekatas, kaļadas – and is rather similar to Halloween. People dress up, paying special efforts not to be recognized, and go from house to house singing, dancing, and playing games. The traditional masks are varied – they can be animals (e.g., a bear, or a crane), people (e.g., a gypsy – fortune teller), or supernatural creatures (e.g., the death or a devil). The masque procession is believed to bring luck for the households that they visit, as well as to scare away evil spirits, so they are usually warmly welcomed, feasted and given small gifts. Want to know who you will marry? Stand with your back to a fireplace and bend forward to look into the fire through your legs and you might see him! Want to know if you will have a good harvest next year? The more stars you can count in the sky on the solstice night, the better your crops will be! Want to have a lot of money? Find yourself a black cat and carry it around the church! Do you know any non-Christian Christmas or winter solstice traditions? Please share in the comments! This post is a part of the Multicultural Kid Blogs Christmas in Different Lands blog hop. Click the photo to read many wonderful contributions about Christmas traditions around the world! I love this post! What fun traditions, and I love learning about the pagan influences that still exist. Thank you!